New Portable PA for Wedding Ceremonies and More! American Audio’s new PPA-210 is a compact portable PA system with built-in digital effects, graphic EQ and portable playback. A complete turnkey system, the PPA-210, contains all the PA gear you could possibly need, including two pole-mountable 10” speakers, an 8-chanel powered mixer, dynamic microphone and every cable — including a mic cable and two 20’ speaker cables — required to set it all up. And when it’s time to pack up, the PPA-210 is a mobile DJ’s dream. The entire system latches together to form one compact unit on wheels for convenient transport and the highest protection possible. There’s even a storage department for the microphone, accessories and cables. Handles on three sides and the unit’s low overall weight add to portability. American Audio makes it easy to quickly set up and break down from a wedding ceremony, then head back to the ballroom for the reception! Convenience is not the only terrific benefit that the PPA-210 offers. With its high quality and many features, the system makes it possible to take great sound with you wherever you go. It includes a 3-band EQ and built-in digital effects on each channel; a 7-band system equalizer with switch; 4 XLR mic inputs; and an internal digital delay effects processor with 16 selections including echo, delay and vocal enhancement. You can customize each of those effects with American Audio’s inclusion of an effects parameter adjustment. To ensure the PPA-210 is always operating at the most optimum level, it provides four performance indicators: Signal, Clip, Power and Protect. The PA system also features a thermal cut off. Additionally, the PPA-210 is equipped with USB and mini jack inputs for easy MP3 playback. You can connect an MP3 player or a flash drive containing music, hit play and walk away from it. The music will play on and on all night! With its great sound quality, portability, and MP3 playback, the PPA-210 lends itself to a wide range of applications. 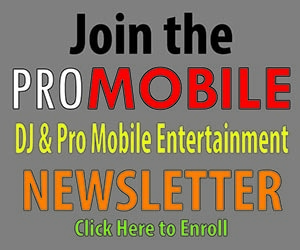 Not only is it ideal for mobile entertainers, karaoke and vocalists, it can also be used by: companies for business presentations; local sports teams as a gameday PA system; car dealers and other businesses that want to provide music on their lots; churches that play music outdoors before services start; and an array of special events. My point? 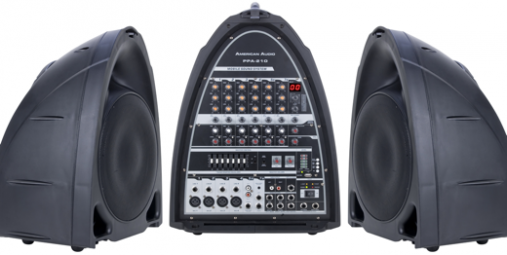 You can add to your bottom-line by providing sound reinforcement with this portable unit. Despite its compact size, the PPA-210 is nice and loud. Power output is a healthy built-in 300W (150W 8 ohms per channel) stereo power amplifier with dynamic distortion processor. Frequency Response provides 20 Hz to 20 kHz 1dB (at send output) or 30 Hz to 20 kHz 1dB (at speaker output, with processor threshold exceeded). Distortion comes in at <0.05%, 20 Hz to 20 kHz, 1 dB below rated output. System Signal-to-Noise Ratio is listed at >80dB @ 1w. And Input Impedance (Channels 1-2-3 and 4) is “Mic” 2k ohm. The PPA-210 has an MSRP of $699.95. The post courtesy of the L2P Network. Live2Play, Play2Live.